away free, hosted social networks fast enough. investors so much that they invested more than $100m in the company. But it wasn’t to be. Last month, Gina Bianchini, Ning’s CEO, resigned. Now we know why: it turns out giving away and hosting free social networks isn’t such a great business after all. Ning is now laying off 40% of its staff and ditching ‘free‘ altogether. That’s right: the thousands upon thousands of users who run a social network will either have to pay up or move out. In short, Ning is switching teams. Instead of trying to be really, really big with a free service, it’s going to try to make money providing a service it hopes some of its biggest users will be happy to pay for. Needless to say, that transition won’t be easy, and the fact that it is cutting staff will almost certainly scare some of its users into looking for a new home. Make no doubt about it: Ning’s move is significant. That’s not because the company itself was ever really important. It was never Facebook or MySpace, for instance. But it was a Silicon Valley poster child for Web 2.0 and the social networking craze. Started by internet royalty, Ning was one of the most well-funded social networking startups around, and one of the few that raised money from Wall Street-type investors. And the fact that it was giving away the farm for free was always promoted as a positive. …Ning wants to foster millions of little networks with narrow channels, each delivering the kind of targeted advertising that Google rode to vast riches. Because in this new phase of Webonomics, it’s not just the eyeballs, stupid, as it was before the dotcom crash. It’s the kind of eyeballs you collect and how you can slice, dice, and model them. [Ning] displays the kinds of ads Web surfers are accustomed to seeing on blogs, news sites, all over the Internet, especially tailored to their particular social-net niche. Extreme skiers see ads targeted to extreme skiing, and so on. Right now, Google places Ning’s ads, but eventually, Bianchini and Andreessen plan to serve their own. At one point, the article went so far as to state, “once a company attracts a certain number of users, it becomes all but unstoppable.” In the real world, of course, Ning is evidence that once a company attracts a certain number of users, its decline becomes all but unstoppable if it isn’t able to find a way to operate profitably. From this perspective, Ning’s fall is perhaps one of the best signs yet that the second internet bubble and its unhealthy focus on ‘free‘ are finally coming to a close. While there’s nothing inherently wrong with ‘free‘, free is tough, and there’s nothing wrong with ‘paid‘ either. As the global economy finds its footing, let’s hope this lesson isn’t lost on a new generation of startups: you can only give away so many free lunches before you go hungry and broke yourself. Photo credit: fczuardi via Flickr. Just yesterday I wrote here about the shift toward less anonymous commenting happening on the web. And today Gawker Media released some interesting numbers proving how weighting reputation has worked as an incentive across their properties. Last summer, Gawker introduced a tiered commenting system, giving more weight to comments from trusted readers and making it harder for other comments to get noticed. What has Gawker found since then? Instituting a class system in their comments section has made more readers comment, more often. Popular European music streaming startup Spotify has been able to survive and thrive in a tough market that has seen its fair share of startup casualties. In an effort to maintain its growth, it has announced the largest upgrade since it first launched in 2008. 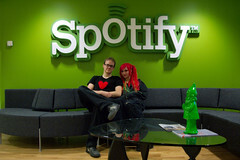 The goal: turn Spotify into a “total music management platform“. The means: a hefty dose of social features.